An Afternoon with the Blue Angels- Interview with a Blue! As the six F-18's taxi to their assigned spots, the technical crews begin their post-flight tasks with the ritual precision that this team is famous for. 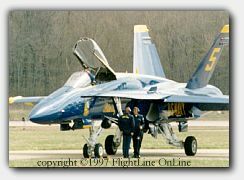 Standing in front of the seven magnificent Blue and Yellow Hornets, we get a close up view of the action. They say luck is the coming together of preparation and perseverance, I will learn on the Media Day that I was the only one to follow the proper chain of command to get interview authorization.....we are indeed lucky today. Momentarily distracted, testing my tape recorder, I am surprised by a very warm "Hello, Sir!". There in front of me, looking like a living recruiting poster, hands clasped behind his back, eyes riveted on mine, stands "Blue Five"; Lieutenant Ryan Scholl! I'm remembering the characters of the movie "Wayne's World" when confronted with their idol.... "WE'RE NOT WORTHY!!" ....This feeling subsides quickly as we begin our conversation. LT. Ryan Scholl is very congenial, I'm immediately comfortable. I congratulate him for his tremendous performance and apologize for the typical Canadian weather (at least, it was not snowing!). "I joined the Navy and have been flying F/18s. When I achieved certain steps in my career, I was then able to apply to the team. The year I applied to the Blue Angels, there were about 65 five applicants for two Navy pilots jobs and I was lucky enough to be part of those two." In fact, Lieutenant Scholl's naval career is quite impressive. After completing Aviation Officer Candidate School, he was commissioned an ensign in March 1988. Earning his wings in February 1990, he then served with attack Squadron 122 (VA-122), the "Gunslingers" of VA-105, Strike Fighter Squadron 105 (VFA-105). 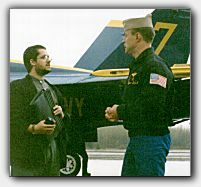 Lt. Scholl then made the transition from the A-7E, to the F/A-18C Hornet. 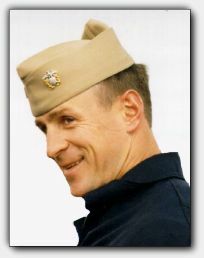 He then completed two sets of work-ups, followed by a mini-deployment, then an extended deployment aboard the aircraft carriers USS Kitty Hawk (CV-63), USS John F. Kennedy (CV-67) and USS Dwight D. Eisenhower (CVN-69). "When I joined the Navy, I wasnt thinking I could be part of the Blue Angels. I was thinking the Blue Angels were the "Be all, End all" of the Naval Aviation and that you had to be a superb pilot of just incredible skills that I didnt possess. As I grew in my flying ability and my flying skills, I found out that just about any Naval aviator could do this job. And once I got on the Team, I realized that that was the truth. 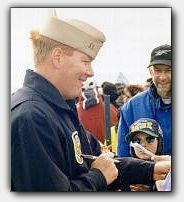 We, on the Team, and especially because they picked me because I am certainly not the best Naval aviator, possess certain skills, certain abilities to talk to the kids. We really love being here and represent the Navy, the Marine Corps and the US Government. And thats why we are here. With the training that is involved in being a Navy pilot, to be able to land aboard a ship and do all the other tactical flying skills that we have, with our training, just about any other Naval aviator can do the same flying that we, in the Blue Angels, do. Its very tough, the toughest flying I have ever done, but we receive training above all training that Ive ever had in the Navy. Thats how we are able to do this, to make it look so exciting, and also yet have it be so completely safe." Obviously, being the Blue Angels Lead Solo has not made Lieutenant Scholl loose the sense of being part of a team. In fact, the Blue Angels success relies on this team effort, from the support/maintenance and administrative crew to the seven Naval Aviators. I also notice Lieutenant Scholl is showing a great deal of modesty! 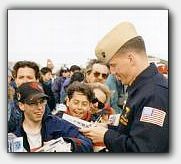 Having won the 1993, the strike-fighter communitys Scott Speicher Award for superior tactical weapon delivery. 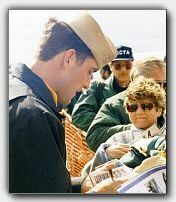 He was also named Carrier Air Wing Threes (CVW-3) Pilot of the Year. He certainly *is* one of the best! "One of the greatest things is being able to walk out and see smiles on the kids faces. Even when you have a day when I didnt perform so well, I gave it all I had and it was just not coming all together for me. But then I see the smiles on the kids faces. To know I am having an effect on what is going to happen in their lives is very rewarding. I may not recruit them to go in the Navy, but hopefully if they have a choice down the road somewhere to go the right way or the wrong way, maybe theyll have a look back and be influenced somewhat by what we do." "I think that one of the greatest things that I talk about is making simple commitments. That you are going to get the job done and that you are going to work as hard as you can at everything you do. Once you have that simple commitment, whether its hanging up your clothes in your closet or even on your final exam, if you do the best you can at everything that you do, there is really nothing that you cannot achieve, whether you want to be a Blue Angel or if you want to be successful at whatever you do." Simple statement but very true. These great Naval Aviators have all made simple commitments, they have committed to being the best they can, at everything they do...this has led them to the top of their profession.... they are the Blue Angels! Floating on a cloud, Pierre-Mathieu, my photographer, and I dash to the car in a vain attempt to avoid the rain (which I hardly notice!) . He tells me he took some very interesting shots of the Hornets, I tell him I've just met one hell of a great person. I am so pumped by the meeting with Lieutenant Scholl, I'm almost ready to head to the nearest recruiter and sign up! Sitting in the car, wet and cold, a wide grin on both our faces, we hear a knock on the window. Standing in the rain is a guy whose coat is bears the logo of a very big and well-known Montreal TV station. "Where are the Blue Angels?" "They've left for their debriefing, you just missed them." Did you talk to them? Did you take pictures? Who are you with?" This meeting was a dream come true and we thank the U.S. Navy Flight Demonstration Team, The Blue Angels, for allowing us to have this time with them!